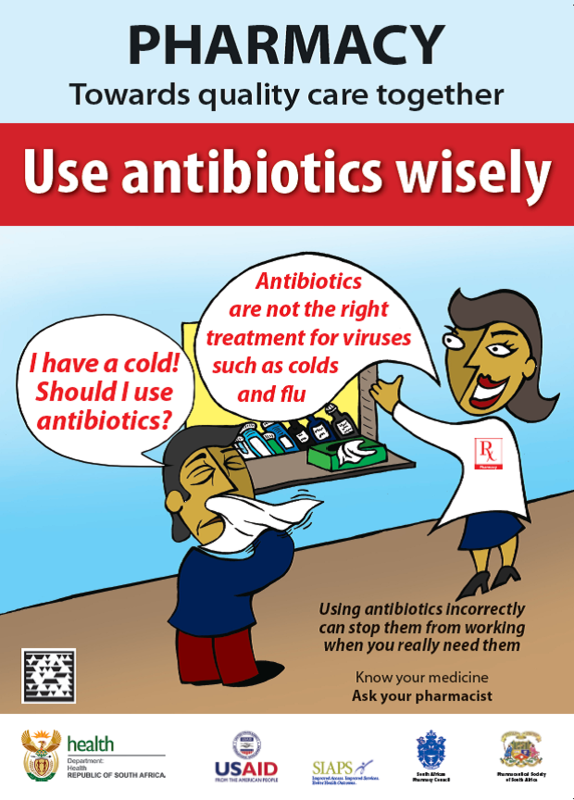 In May 2014, the World Health Assembly called for global action to address the growing threat of antimicrobial resistance (AMR). SIAPS South Africa (SIAPS-SA), understanding the need for a coordinated national response, worked closely with the National Department of Health (NDoH) on the development of the National Antimicrobial Resistance (AMR) Strategy Framework 2014-2024 and the institutionalization of a self-assessment and continuous quality improvement approach to enhance infection prevention and control (IPC) programs. This intersectoral and multidisciplinary engagement culminated with the AMR Summit held in Johannesburg on the 16 October 2014. With participation from the Minister of Health and chaired by the Director General for Health, the AMR Summit fostered consensus on the interventions needed to prevent the emergence and contain the spread of AMR in South Africa. Participants from public and private sectors, professional bodies and civil societies, and various government departments committed to working together to implement the strategy. SIAPS-SA worked with the NDoH on the development of a commitment poster reflecting three objectives and three enablers of the strategy, commitment statements as well as actions and time frame. The commitment poster was signed by respective representatives, including MSH/SIAPS, as they undertook to provide the necessary resources and efforts to achieve the AMR targets. The inappropriate use of antibiotics is a major driver of AMR. Patients have a major—and often underacknowledged— role to play in improving rational use of antibiotics. SIAPS and its partners highlighted the importance of appropriate patient use of medicines during Pharmacy Week 2014. Pharmacy Week, which is held every year in the first week of September, aims to teach patients and communities about the value of pharmacists and good pharmacy practice by focusing on a different pharmacy-related theme every year. 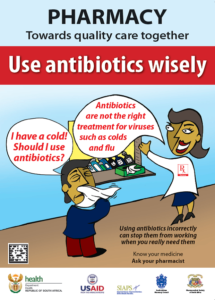 As part of the 2014 theme, posters and flyers were developed in nine of the eleven official languages to encourage the appropriate use of antimicrobials. In particular, these materials highlighted the fact that antibiotics are not effective in treating viruses—a common misconception among patients. SIAPS also supported NDoH in educating health care providers during the launch of the national hand hygiene campaign. Hand hygiene has been identified as a key element of IPC. As South Africa prepared itself to fight a potential Ebola outbreak, it became clear that South African health care providers needed better education on proper hand hygiene. SIAPS provided the NDoH with hand hygiene posters to encourage behavioral change, and SIAPS teams have travelled throughout the country offering hand hygiene workshops to providers. 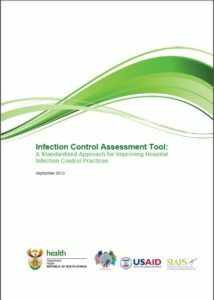 These educational initiatives, as well as the institutionalization of ICAT/CQI in South Africa, illustrate how an HSS approach that fosters teamwork, strengthens existing systems, and places value on provider education, can promote country ownership and result in strong and sustainable IPC systems.